CSUN Vice President for Student Affairs and Dean of Students William Watkins honors the 10 2017-18 Presidential Scholarship recipients, a prestigious scholarship awarded each year. Photo by Lee Choo. CSUN Vice President for Student Affairs and Dean of Students William Watkins speaks to CSUN's 2017-18 Presidential Scholarship recipients. Photo by Lee Choo. CSUN President Dianne F. Harrison speaks to the 2017-18 Presidential Scholarship recipients. Photo by Lee Choo. 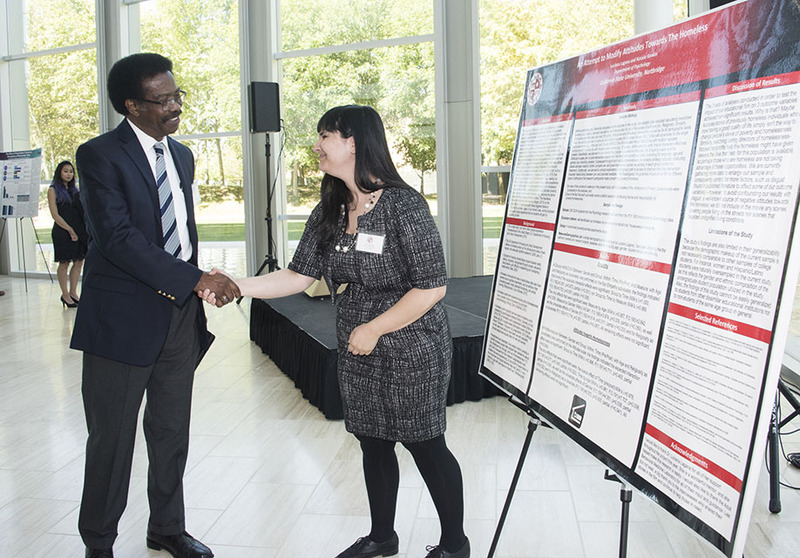 Presidential Scholar Jasmine Ruffin discusses her research with CSUN President Dianne F. Harrison and President’s Office Chief of Staff Jill Smith. Photo by Lee Choo. 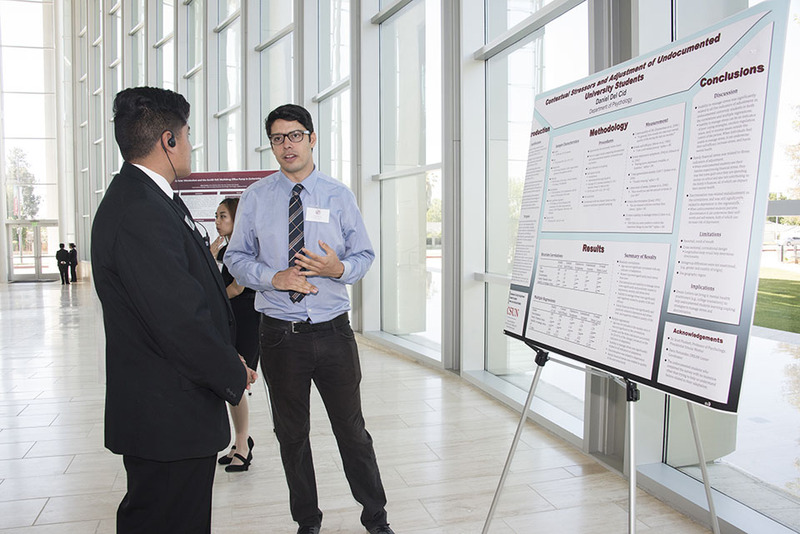 Daniel Del Cid (psychology) explains his research at the 2017-18 Presidential Scholarship recipients, a prestigious scholarship awarded each year. Photo by Lee Choo. 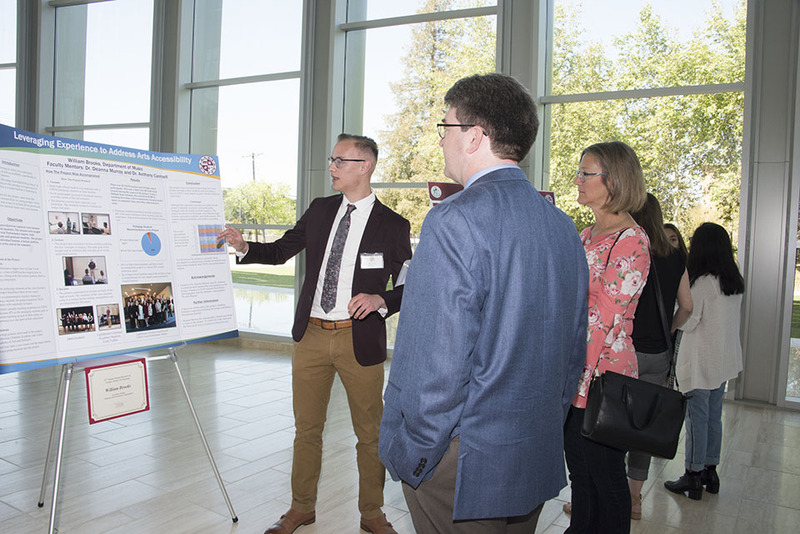 Presidential Scholar William Brooks discusses his research at the 2017-18 Presidential Scholarship recognition event. Photo by Lee Choo. 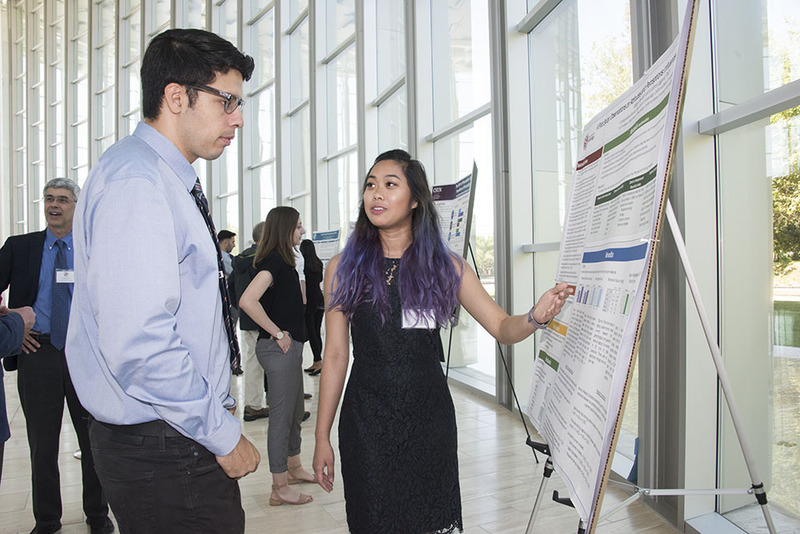 Abigail Pajulas explains her research at the 2017-18 Presidential Scholarship presentation. Photo by Lee Choo. 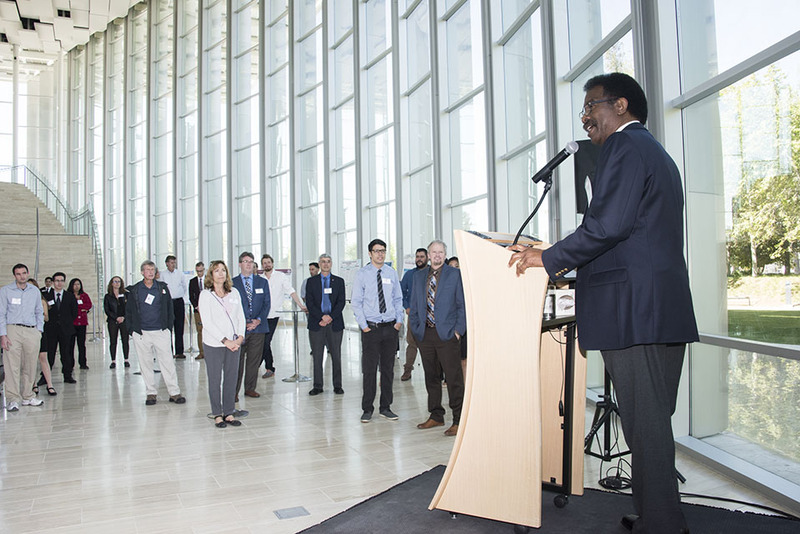 The annual event featured 10 presentations from the 2017-18 Presidential Scholarship recipients, a prestigious scholarship awarded each year. Photo by Lee Choo. Gissel Rochin discusses her research at the 2017-18 Presidential Scholarship recognition event. Photo by Lee Choo. Presidential Scholar Natalie Rankin shakes hands with Vice President for Student Affairs and Dean of Students William Watkins at the 2017-18 Presidential Scholarship presentation. Photo by Lee Choo. 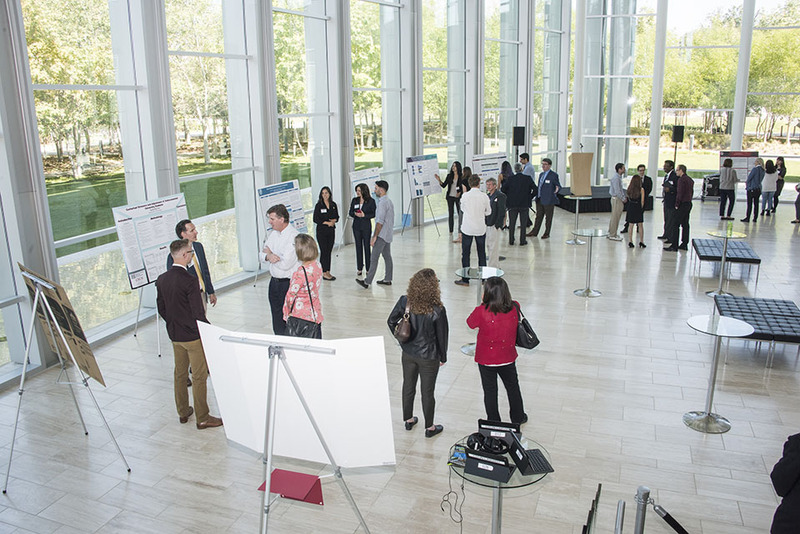 Recently, 10 California State University, Northridge student researchers displayed their yearlong projects at the 2018 Presidential Scholars Exhibit in the Grand Lobby of The Younes and Soraya Nazarian Center for the Performing Arts. It was the culmination of creativity, commitment and hard work for these scholars. 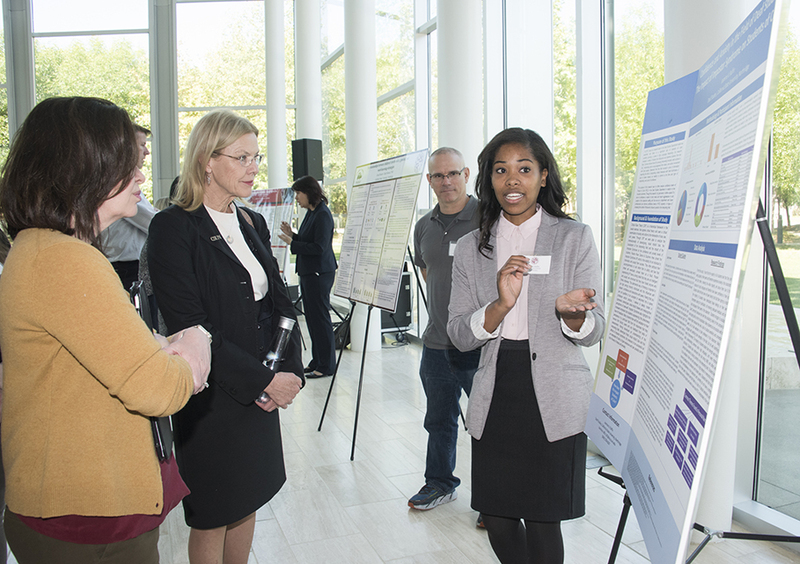 The annual event featured presentations from the 2017-18 Presidential Scholarship recipients, a competitive scholarship awarded each year that gives undergraduate students the opportunity to work with faculty mentors to develop, complete and present an outlined research project. 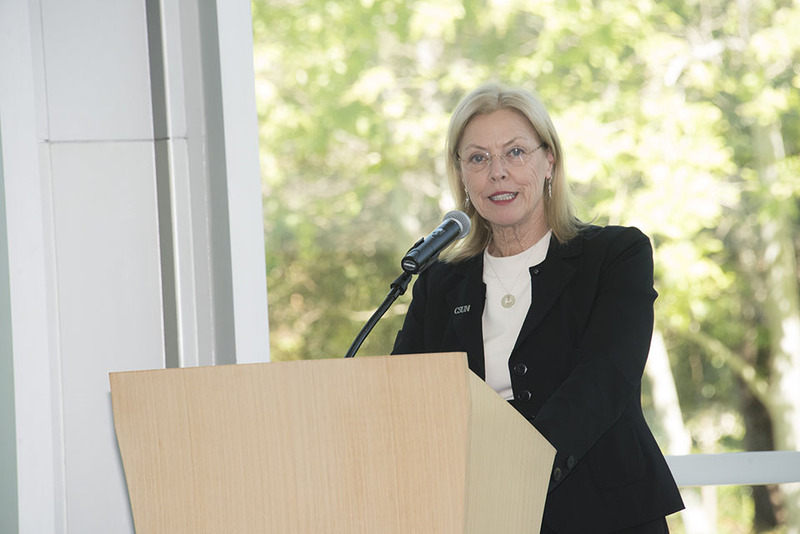 “I always look forward to this event,” CSUN President Dianne F. Harrison said. “It is our opportunity to hear about the exciting work that our scholars have done over the past year. I am thoroughly impressed with the quality of their work. We know that this is a high-impact project and that with the financial support provided by the scholarship, our students are able to expand their knowledge and their discipline with a hands-on approach, benefiting them in their continued academic growth. CSUN Vice President of Student Affairs and Dean of Students William Watkins greeted the outstanding students and their matching mentors. “One of the really wonderful things that begins our academic year is our gathering at the University House, and today, we have the chance to be treated with some really great presentations by our students,” Watkins said. This year’s scholars included Gissel Rochin (child and adolescent behavior), Daniel Del Cid (psychology) and William Brooks (music). 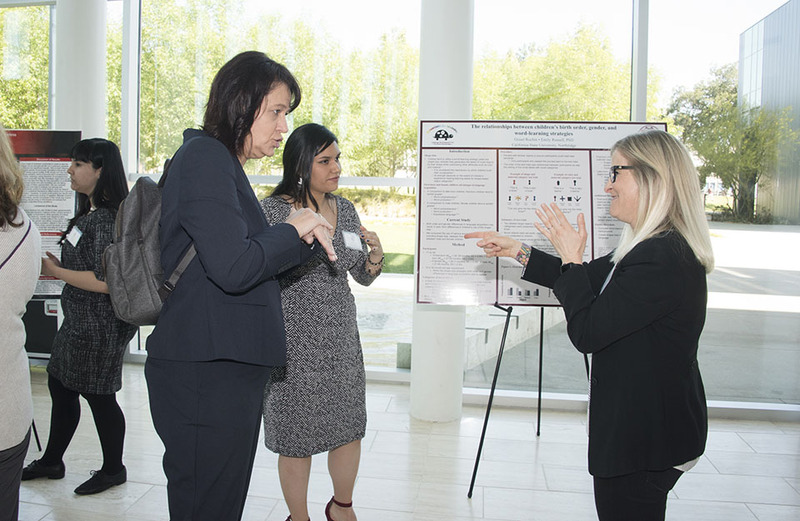 When Rochin received the scholarship, she said she “couldn’t believe it, because it’s such a prestigious award.” At the event, Rochin presented her project called The Relationships Between Children’s Birth Order, Gender, and Word-Learning Strategies. Rochin based her project on research that found that in comparison to later-born children, first-born children tend to exhibit greater word comprehension and word production. Other scholarly research has also shown that in comparison to male children, female children tend to exhibit greater word comprehension and word production. To test this theory, Rochin used the idea of shape-bias, or the tendency of infants and children (as well as adults) to generalize information about an object by its shape, rather than its color, material or texture when learning nouns. Her participants were eight female children and nine male children. “I’ve always had an interest in birth order, because, growing up, I always heard that it’s always the first-born children who do so well in school, or they’re more responsible — it interested me,” Rochin said. “The whole purpose of my project was to see if there was a relationship between first-born children and female children. “I couldn’t have done this without the help of my mentor, Dr. Emily Russell, [associate professor in the Department of Child and Adolescent Development],” she added. Del Cid studied undocumented college students to try and understand more about their mental state in his project Contextual Stressors and Adjustment of Undocumented University Students. “The purpose of my study was to examine how risk factors such as discrimination, depression, inability to manage stress and family financial stress impact the lives of undocumented college students,” he said. To test this, he surveyed males, who made up 25.9 percent of his participants, and females, who made up 74.1 percent, between the ages 18 to 29 years old. In Brooks’ project, Leveraging Experience to Address Arts Accessibility, he wanted to observe the lack of arts accessibility, specifically in the area of voice lessons. Voice lessons can range from $40 to $100 an hour or more depending on the prestige or experience of the teacher, which is a major barrier to learning how to sing. Results showed that pedagogy students benefited from the experience through the students’ willingness and confidence to participate in a non-mandatory recital. Specifically, 30 students participated in the performance. Additionally, survey data showed that 100 percent of the high school students said they would recommend Brooks’ project to a friend, and 81 percent would participate again.